Remember many moons ago when I bought a shiny new bike? I haven’t enjoyed said shiny new bike as much as I would like of late, and I blame it squarely on the fact that I had to keep my bike in my storage locker, as my building has no bike room and we aren’t allowed to bring bikes into our suites in my building. 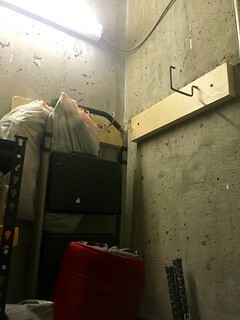 But my storage locker is an oddly shaped little concrete room in the parkade with a door that opens into the locker (thus rendering a big swath of the floor space unusable for storing things). Which meant that it was difficult to get my bike in and out of said storage locker, which meant that I haven’t been riding my bike that much. At one point I got the brilliant idea that I should install a bike hook on the wall in my storage locker, so that my bike could be stored off the ground so (a) it wouldn’t take up floor space and (b) it would be easier to access since I could just lift it off the bike hook over all the other stuff in there to take it out (it’s very light, so it would be totally doable). I even went so far as to ask my strata if I was allowed to do it and they said it was fine. And then… I just didn’t get around to it. And then a couple of years went by and I still didn’t do it and I barely rode my bike. When Scott moved in recently, we had to figure out how to combine all of his stuff with all of my stuff into a 700 square foot condo. And one of his stuffs was also a bike! 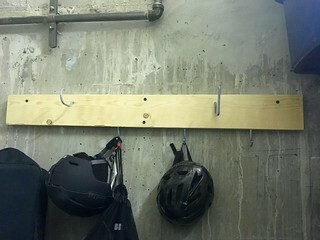 So we reconsidered my installing bike hooks in my storage locker, but then came up with an even better idea. 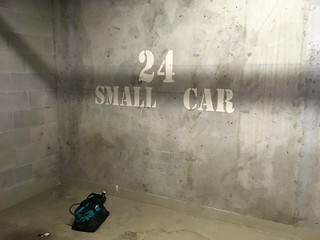 Several parking spots in my parkade have bike hooks in the wall of the parking spot. 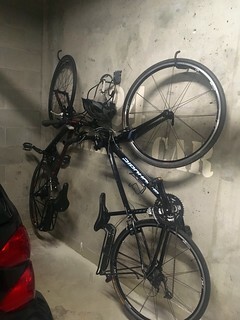 So we decided that it made more sense to store our bikes on hooks in my parking spot, which would free up more room in the storage locker for all our other various stuff and things. 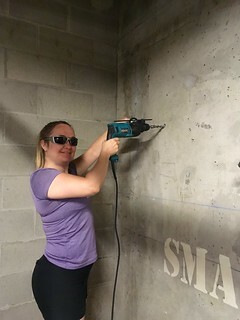 So I asked my strata if that was allowed and they said it was – and so off we went to Home Depot to rent a hammer drill! 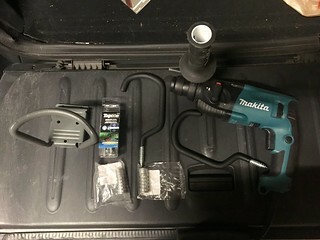 I don’t think that the woman at the rental desk at Home Depot had much faith in us when we asked to rent a hammer drill. “Have you used one before?” she asked. “No,” we replied. She gave us a skeptical look, then showed us how to use it, then gave us another skeptical look. She asked what we were using it for and when we told her, she said, skeptically, “Does your strata allow that?” I said that I had asked them and it was allowed, and she said, “Mmm hmm,” in a tone that suggested she remained skeptical. You stick the tube-looking things into the hole that you drilled and then you screw in the big hook – as you screw the hook in, it gradually opens up the tube-looking thing so that the tube-looking thing takes up all the space in the hole you made and it anchors the hook to the wall. Easy-peasy. We also installed the gray loop thingy on the left side of the photo into the wall (we used the hammer drill to make smaller holes into which we could screw that gray thing) so that we can look our bikes to that thing. Even though my parking spot is behind two gates in a parkade with various security features, you can never be too safe! Those hooks, combined with the fact that we also put a shelving unit in there, means my storage locker now holds twice as much stuff, but it is also so much more accessible than when it was just boxes and buckets piled up on top of each other. This makes me a happy camper!